2017 was a formative year for artificial intelligence, not only regarding the technology itself, but also our own crucial understanding of how it works — or should work. Early last year, AI learned how to detect minute vertebral compression fractures on x-rays that are often overlooked in the emergency room. In March, OpenAI generated a system that could replicate a process in reality after having seen it just once in a simulated environment. Chinese startup Face++ developed an AI facial recognition software that enables users to pay for things with their face. AI was trained to fly drones autonomously, a task involving complexities such as real-time situational awareness and multi-spectral perception. And in November, a robot called Xiaoyi passed the National Medical Licensing Exam — the first ever to do so. This rapid technological evolution shows no signs of slowing down. From marketing to cybersecurity, AI has already proven to be both useful and practical, and it’s quickly becoming embedded in everything we do. Most excitingly, advancements in AI are poised to change healthcare dramatically for the better. So what may the upcoming year hold for AI in healthcare? 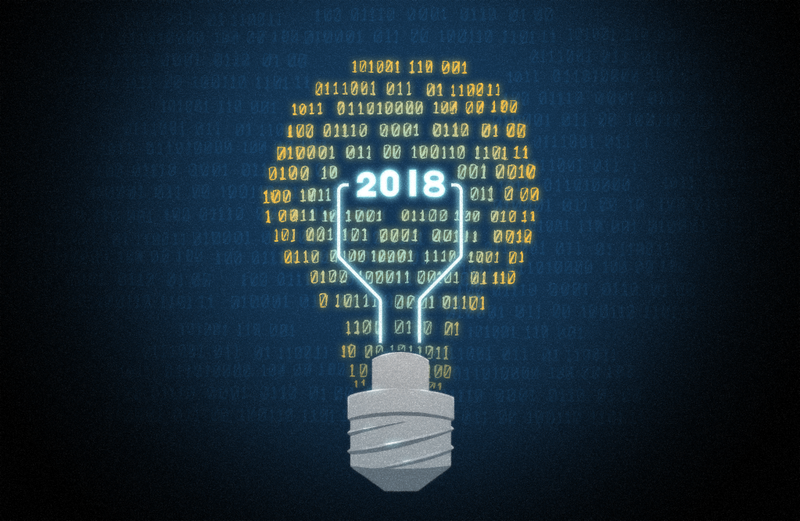 We spoke to Mike Monteiro, artificial intelligence thought leader and Chief Product Officer at Aspire Ventures, who gave us a few 2018 predictions. "The AI boom is going to hit a wall on scalability very soon, and that’s a good thing. We’re approaching a bottleneck of human talent and algorithmic techniques as AI’s challenges become more complex with a broader scope. Having a team of data scientists and AI experts dedicated to manually developing an algorithm works just fine for single problems with controlled parameters. But if we want to scale to complex problems such as those in healthcare, where solutions will need to account for a wide range of variables like the unique biochemistries, genetics, gut biomes, or behaviors of each individual, we’ll need an AI that can craft and refine its own algorithms with minimal human guidance. The good news is that necessity is the mother of invention, and the bottleneck of talent is already leading to the exploration of new horizons in research that could lead to a more autonomous AI. In the coming year we’ll be hearing a lot more about AI that can build its own algorithms — what I call Meta AI, and its subfields like AutoML and Meta Learning — as AI research addresses the scalability problem with less supervised approaches." "I expect to see greater efforts to make AI’s decision making processes more transparent in 2018. The black box approach to AI is fine when you want to mystify consumers with a sense of magic, but that approach will not suffice if we want to transform healthcare. Doctors need to be able to explain to patients how they reached their conclusions and justify the logic behind their treatment decisions — and in order to do that, the AI will need to be able to explain itself to doctors. The problem with neural networks is that they’re incomprehensible. In order for AI to make a real impact in our care, we will need better meta analysis so that doctors can interpret it." "There is a perfect storm of influencing factors coming together that could make 2018 the year that we get serious about adopting precision medicine to address population health. Patients’ tolerance for one-size-fits-all diagnoses and therapies are reaching a breaking point. Wearable and mobile technologies have become so advanced and so widespread that patients now have far more actionable health data about themselves than they’ve ever had before. At some point, patients will demand that that data be taken into account by doctors. Moreover, those same technologies have helped to disrupt nearly every other sector and shift consumer expectations for a better experience that is more convenient, more effective, and less costly. To win patient satisfaction, providers are going to have to show they can truly listen to their patients, process the wealth of data their patients have on their own health, and show how they’re taking it all into account as they recommend next steps. Fortunately, recent advancements in artificial intelligence will allow it to deliver on its promise to change healthcare and help doctors utilize the new wealth of data for radically personalized care. 2017 was a record-breaking year for precision medicine investment, and the returns on those investments could start paying off in the form of better public health much sooner than we think."